SPAMEXAMINER is the easy-to-use Hosted Anti-Spam solution for companies, organizations, and individuals that have their own domain name and want to get rid of spam without buying and maintaining their own anti spam serve. It is perfect for businesses that want to get rid of spam nuisance as well as who don't want any maintenance whatsoever.SPAMEXAMINER offers online reporting to administrators for his review and Quarantine reports direct to user's mail box for further action . Our service filters out up to 98% of all email spam, with a very low false-positive rate. It doesn’t matter what industry your company is in; SpamExaminer will help your company keep your network clean of unsolicited email, pornographic material, viruses, and devastating worms. You can try it 15 days for free trial. No long-term contract is required to start your trial. If you choose not to cancel your services before your trial period ends, we will start billing you 15 days after the trial starts. SpamExaminer works at the Gateway level ensuring that only legitimate and virus free emails reach your mail server. SpamExaminer removes unwanted emails and this reduces the load on your mail server which in turn increases performance, creates a higher level of security and reduces the work load on your IT staff. 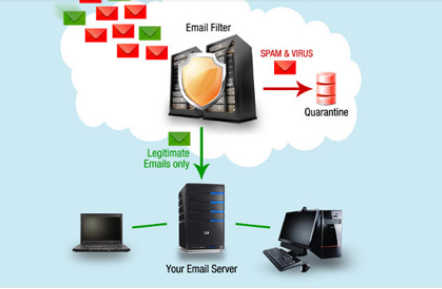 SpamExaminer eliminates spam and viruses before they enter your network. SpamExaminer dramatically reduces the number of messages your users have to go through in order to reach legitimate emails. SpamExaminer removes phishing emails, preventing your users from accidentally giving out confidential or private company information. Because our anti spam filter significantly reduces email spam, you are able to focus on real tasks and increase your productivity instead of managing your spam. Fast implementation. Usually under one hour. No upfront cost for the trail period, period! Pornographic content emails are stopped. Worms and viruses are stopped. No obligation to continue after the trial period.